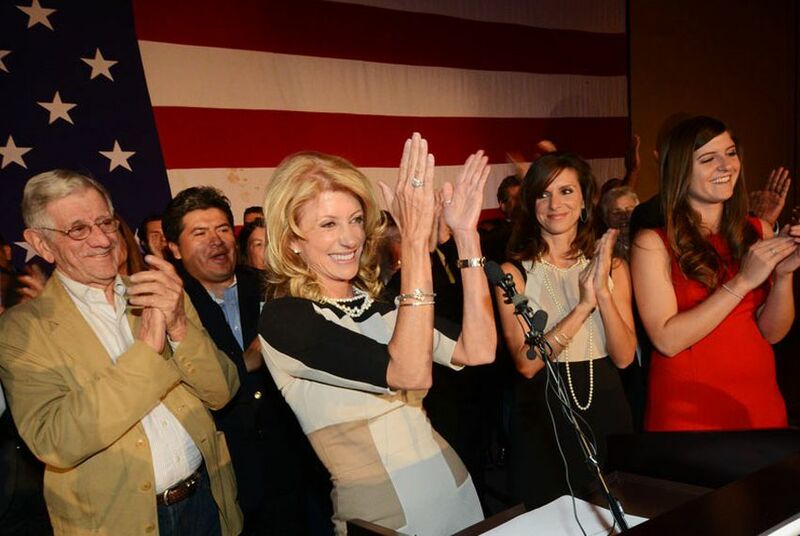 State Sen. Wendy Davis, D-Fort Worth, narrowly kept her seat on Tuesday night. One of the Democratic Party's rising stars, she fended off Republican state Rep. Mark Shelton in a bitter campaign contest. State Sen. Wendy Davis, D-Fort Worth, narrowly clung to her seat on Tuesday night, fending off Republican state Rep. Mark Shelton in the most-watched legislative race of the Texas election. The outcome — a 51 percent to 49 percent split — was a big win for Davis, a Fort Worth lawyer who spent the last month fighting against allegations by Shelton that she was corrupt and self-dealing. Her win kept Republicans from coming within one vote of the two-thirds majority needed to render Democrats virtually powerless in the upper chamber. And it gave hope to Texas Democratic Party officials, who see Davis as a rising star and a potential a statewide candidate. The Tarrant County district was hardly a certain bet for either candidate. It has traditionally leaned Republican: Gov. Rick Perry won the district in the 2010 gubernatorial race; U.S. Sen. John McCain, R-Ariz., won the presidential vote there in 2008. But four years ago, Davis, a veteran of the nonpartisan Fort Worth City Council, unseated Republican state Sen. Kim Brimer with 49.9 percent of the vote to Brimer’s 47.5 percent, with a Libertarian candidate taking 2.6 percent of the vote. This year, Davis ran in that same district after federal courts threw out redistricting maps Republican lawmakers drew last year, which would have made the district difficult, if not impossible, for her to win. Davis, who fought back against Shelton’s allegations by calling him an ideologue who catered to the whims of the far right, is the first Democratic state Senate candidate to receive more than 50 percent of the vote there in the last decade. Though she was narrowly behind after early voting totals were tallied, Davis bounced back, ending the night with a roughly 6,000-vote lead. "I think it’s really a reflection of people wanting a bipartisan voice," she said. "People rose above partisanship in the way they voted tonight. They voted for integrity, for a fighter." Shelton's campaign said he wouldn't be available for comment on Tuesday night. But his campaign manager, Clayton Stewart, said they are "very proud of the campaign that we ran." "This is the beginning, not necessarily the end," Stewart said, noting that Shelton has not ruled out a future run. "We're very proud of our candidate and look forward to seeing what Dr. Shelton may be doing in the future."